This post is for anyone who has ever tried to face their fears, even if they haven’t always been able to overcome these, and for one particular friend whose constant attempts to combat her aviophobia has been truly inspirational. We all fear different things, some of us fear snakes (ophidiophobia), some of us fear confined spaces (claustrophobia), and apparently some of us even fear beards (pogonophobia). My biggest fear is wasting my life (deficit-vivophobia?). Much like Roosevelt and Professor Lupin said what my fear really comes down to is itself. I am afraid fear will stop me from living my life (see The Why), so to stop this paralysing me, when I know I’m scared of things I try to confront them. For example, I used to be afraid of groups of young people (all that slang and acne is terrifying) so I volunteered for a youth project working with these very same frightening specimens and I actually quite enjoyed it. I know that fears come in different shapes and sizes and for some they are much more debilitating than for others and I wouldn’t want to belittle that. For those people with genuine deep-seated phobias then facing those fears head on may not necessarily be the best course of action for you. Especially if your fear is of being run over by busy traffic. Most phobias are things we acquire in life, whether consciously or subconsciously, and the only fears we are born with, that are innate to all human beings is that of loud noises (ligyrophobia) and that of falling (basophobia). Being a brave soul (pronounced ‘moron’ in some dialects) I have tackled both of these fears since my arrival in Geneva. 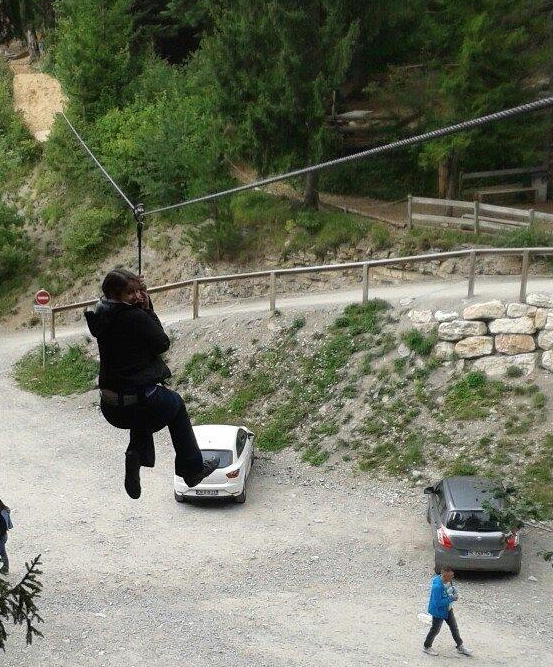 I took on the fear of falling by willingly agreeing to participate in a rope adventure course in the trees of Annecy (a lovely French town near Geneva) with a group of friends from work. I’m not ashamed to admit I was a little anxious. We all share this same fear of falling and chances of that fear being realised are somewhat increased if we choose to clamber about trees on unstable pieces of wood tied together with bits of string. But I thought about it sensibly and concluded that it would be bad publicity, and therefore not in the park’s interests, for its clientele to fall to their deaths, so I decided to trust in the harness, grips and cables to prevent my plummeting to the earth. I can honestly say as I performed each task, varying in intensity and requiring an immense amount of concentration wobbling form one bit of wood to another, I utterly failed to enjoy each moment, but what made up for all this anxious manoeuvring was the adrenaline rush that kicked in after I landed on each secure platform in the trees. However it surprised me to discover that the zipline concluding each course was the biggest challenge I was to face throughout the day as I had anticipated this to be the most fun. What I hadn’t thought about was that you have to deliberately let yourself fall from a platform some 30 feet up. Every fibre of my being was screaming DO NOT DO THIS, THIS IS A BAD IDEA but I thought if we can learn to be afraid of things we can also learn not to be afraid of things. I had my harness and as there wasn’t a pile of bruised and battered bodies on the ground below I decided I could trust in this and overcome the fear. And actually the zip line was amazing, I really did enjoy the sensation of whizzing through the air suspended from a rope. The fear of falling wasn’t something I permanently overcame but I managed to overcome it enough when I needed to and to be able to enjoy that moment. I think that counts as a success. The fear of loud noises I challenged by having a go at shooting real guns with live ammunition. I have tried shooting before, when I was in Cambodia, but that was quite a different experience where safety is barely a consideration as you are presented with a restaurant-style menu of guns to choose from at different costs and apparently if you really want to, and have $300 to spare, you can pay to blow up a live cow. I don’t want to kill things but I like shooting, I don’t believe the two have to go together. In Geneva my shooting experience has been in a safe indoor environment with a trained firearms instructor drilling the importance of safety into me and without even the hint of an option of blowing up farmyard animals. I like the psychology that’s involved with shooting. Most people when shooting for the first time recall their fear of loud noises that will come from the gun exploding. The result of this is an instinctive reaction to push the gun away from you and to close your eyes at the moment of pulling the trigger. This has the effect of forcing the gun down and results in shots falling below their intended target. THE CAMBODIAN SHOOTING EXPERIENCE. 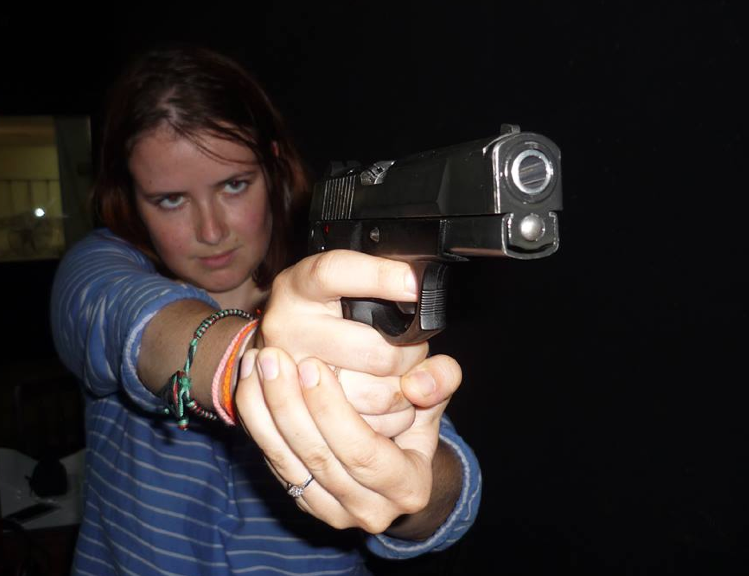 For the record not how you should hold the gun and definitely shouldn’t have been allowed to take a photo whilst pointing a real gun at someone! Part of the instruction is trying to overcome this fear and as the fear of loud noises is innate the best way to go about this is in trying to trick yourself so that your body doesn’t react until it is too late and the shot has already been fired. It is a wholly absorbing pastime as every shot requires an intense amount of concentration as you think about maintaining the correct position, lining up the sights and pulling the trigger very slowly (so the moment of explosion takes you by surprise). Yes, every time the gun goes off and makes that loud noise it is startling but you learn to overcome this alarm so that you can make each shot and have the satisfaction from seeing yourself improve. Unless that fear is spiders (arachnophobia), when I recommend leaving well alone until a bearded man removes it or a cat eats it. Unless you are also afraid of bearded men and cats, in which case maybe just running away as fast as possible is the solution. But heights – no-oo……well done for attempting it! I understand about the shooting though. As someone with similar crap eyesight I too am surprisingly good at it. It’s the intensity of the concentration required that is so satisfying. Or maybe we are just bloodthirsty…. I like to think it’s the intensity of the concentration and not abnormal levels of bloodthirstiness. Although I think shooting is a good means of combining the two. If you’ve had a really bad day and want to kill things then the intense concentration required with shooting can help clear your mind and calm you down. So it turns out Americans are right, having guns is a good thing. With the caveat that they are only fired in nice safe environments at targets and not other people/helpless shopkeepers/etc. Thanks Rick. Photo was taken during my first shooting experience in Cambodia when they are less concerned about the international shooting rules and more concerned about the dollars! I was definitely guilty of forgetting to breathe. Everytime the instructor pointed it out I realised I’d not been breathing and that obviously that wasn’t a good thing but then a few shots down the line I’d get so absorbed I’d forget all over again.